Isn’t it always the way that when you finally decide to go somewhere, you meet the most amazing people right before you leave? Well, this time was no exception. A few weeks before I came to Copenhagen, I met Sigrid Geddes. She is a beautiful, inspiring and accomplished young woman who created her own natural skin care line, appropriately called, Sigrid Natural Skin Care. Hailing from rural Ontario, Sigrid is inspired by her natural surroundings, creating all natural products made with high quality ingredients from botanical sources. 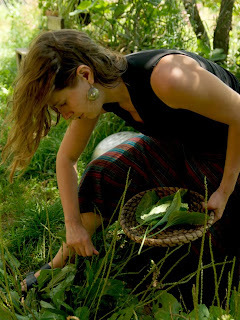 Sigrid even goes so far to wildcraft many of her herbal ingredients. Wildcrafting is the method of collecting plant materials in their natural or “wild” habitat for food, medicinal, or other purposes. This practice shows Sigrid’s respect and care for environment, and her desire to be involved in every step during the creation of her products. The other ingredients, such as beeswax, honey, and hemp oil are also sourced locally from friends and farmers. Incredible! Sigrid Natural Skin Care began in the summer of 2004, shortly after Sigrid’s personal experience with a homemade herbal salve. A wound in her hand wouldn’t heal with conventional drugstore creams. Frustrated, she decided to try her friend’s homemade comfrey salve. Within a day the swelling went down and the infection ceased. Excited about the efficacy of this homemade product Sigrid asked her friend to teach her how to make it. She immediately fell in love with the experience of crafting natural herbal body products, and thus Sigrid Natural Skin Care was born. The extensive natural skin care line includes body butters, face creams, healing salves, ointments, lip balm, massage oil, a face mask, an eye elixir, even diaper rash cream for your little one, and a healing balm for your man’s hands! Sigrid constantly strives to keep the health of our earth at the core of product production and decisions relating to the direction of the skin care line. Her goal is to provide quality products with a minimal environmental footprint, holding the belief that less is more and that any consumption of resources has an impact on our planet. She even delivers her products by bicycle or on foot, giving new meaning to the term “personal touch”. I admire Sigrid’s dedication to using natural, local and organic ingredients, and I identify with her passion for creating products that honor the earth as much as the body. As we all know, cosmetics and personal care products can be loaded with harmful chemicals, dyes and perfumes. Not to mention, they are made by faceless people who put the bottom line before your health. Sigrid employs completely natural processes and uses the most effective, carefully selected ingredients. 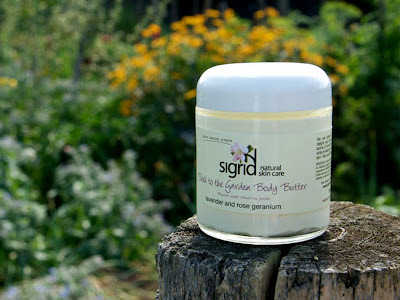 I have been lucky enough to indulge in Sigrid’s goodies for the past month and absolutely love the results! The body butter and face creams, my personal favorites, are incredibly luxurious. Even though I am away from home, I still feel a little part of me travels back across the pond when I’m using a homegrown creation, made by a friend. 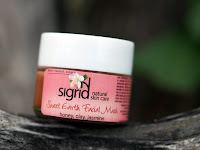 If you are interested in learning more about Sigrid’s Natural Skin Care, and for purchasing information, please visit her website, http://sigridnaturals.com/. I came across Sigrid’s products after putting the winning bid down on products she so generously offered to the Georgian Bay Turtle Hospital (in Orillia) fundraiser last year. I love her products and have since purchased more. Maybe one day she will franchise, so I can stay at home with my little one 🙂 I am definitely a believer in Sigrid products, especially her face cream and comfrey cream. Sounds like an amazing company! I would love to try one of their products! I started using natural cosmetics myself several years ago, when I became allergic to many synthetic chemicals! Thanks a lot for sharing! Basically wrinkles appear due to growing age. Apart from that there are many a reasons due to which premature wrinkles appear on your face or skin. Are you unable to cope with the wrinkles in your face? If your facial deformity is making you unattractive in front of your hubby and he is drifting away from you, then it is time for you to find out an appropriate solution. A host of skincare treatments are available to erase the wrinkles from your face completely but if you opt for the Revitol cream, the look of your face would be entirely changed and the lines on your face would be a matter of a bygone era. Revitol cream is a product of the Revitol company and all Revitol natural skincare products are available for you at http://www.herbsncures.com/. Just started using Sigrid’s face cream. Love it for so many reasons, the first being that it’s 100% natural and locally sourced and the second being that I love putting it on my face! It’s a lovely product.